Bloom is a delicate, floral gin enriched by the natural botanicals pomelo, camomile and honeysuckle. The honeysuckle provides natural sweetness, the camomile gentle calmness, while the pomelo brings a sun-drenched citrus note. Bloom's delicate profile perfectly complements desserts. Try with sorbet. 29 International Awards since 2008. Gold Medal - The Fifty Best Gins 2015. Silver Medal - International Wine & Spirits Challenge 2015. Bronze Medal - San Francisco World Spirits Competition 2015. Tried & True Award - Ultimate Spirits Challenge 2015. 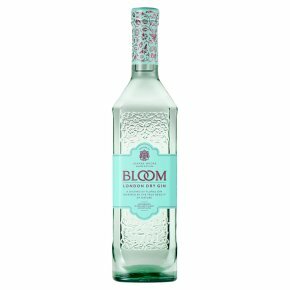 87% Very Good - The Ultimate Spirits Challenge 2015.BLOOM is a light and floral London Dry Gin, inspired by the true beauty of nature. BLOOM Gin was created by Joanne Moore, one of the world's first female Gin Master Distillers at the oldest gin distillery G & J. Chamomile, pomelo and honeysuckle were chosen as the three key botanicals, each one helping in its own unique way to create a more delicate and subtle gin drinking experience. BLOOM London Dry Gin is best served with Tonic Water and quartered strawberries. Ingredients: 50ml BLOOM, Fentimans Tonic, 3 Strawberries to Garnish As Joanne Moore's favourite cocktail, BLOOM Gin is equally delicious served as a French 75. With 25ml BLOOM London Dry Gin, 25ml Freshly squeezed lemon juice, 10ml Sugar syrup (1 water:2 sugar), and quality Prosecco or Champagne.d: Shake thefirst three ingredients with ice and strain into a chilled champagne flute. Top with bubbles and garnish with pretty edible flowers.